Elizabeth continued her walk alone, crossing field after field at a quick pace, jumping over stiles and springing over puddles with impatient activity, and finding herself at last within view of the house, with weary ankles, dirty stockings, and a face glowing with the warmth of exercise. If Elizabeth Bennett (beloved heroine of Jane Austen’s Pride and Prejudice) had been a figure skater, no doubt she would have agreed with Ben Agosto‘s advice (given to me by Laurie, alas, not the man himself) that working those ankles is a good idea. Laurie shared with me Mr. Agosto’s stress on the “glankles” (glutes + ankles) as keys to better skating. There is a lot out there about developing glute muscles, especially for skaters (for instance, this article by a physical therapist identifies the gluteus medius as the most important muscle for figure skaters). I have been really working on firing up those glute muscles, especially the underdeveloped ones of the left side; this is something I should have been doing years ago. Thinking about my ankles, on the other hand, hasn’t been on my radar as much. Laurie has me using my ankles more to get into the ice, especially on transitions. Mr. Agosto suggests thinking of working the ankles in a constant motion, like chewing gum. A smooth and relaxed ankle bend encourage deeper knees, centers the body over the right part of the blade, and makes for a better push. Using my ankles really helps on moves that I’ve been struggling with, like the back outside to forward outside transition. If I think of working my ankles up and down like Pac-Man, it seems to help. 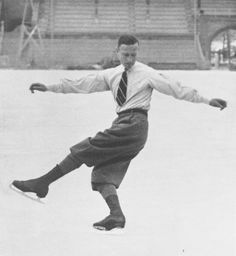 Another good another way to get myself to use my ankles is to think of Ari’s advice about drawing a 7 on the ice at the end of the back outside edge. I’m calling this my lucky seven; if my skating gets better, I’ll feel really lucky. The swing roll should start deep; after that the curve can relax and flatten into the change of edge. Laurie is having me practice loading energy into the swing roll; Ari describes this as an outside power pull. On the left side, I really need more stability to do this effectively, which basically means getting my hip underneath me rather than pitching forward. Call out the glutes! Scrunch up that side! Damn the torpedoes! I have to be more definite about the change of edge, so that it’s clear that I’m doing mohawks (inside to inside) rather than choctaws (outside to inside). Using my ankles more here would help with this too. I worked on “creepers” with both Laurie and Ari. Both were alarmed at the way I’m locking up my free leg when I’m skating on my left side (which means I’m still letting my free side pull me off my edge at times). I need to know when to relax! I also need to take my time in allowing for the proper rotation of the core. It helps to stand up straighter (think like a pencil), and to use those ankles. Check out Gillis Grafström’s core rotation and ankle bend on this back outside edge. The week’s other highlights also included the Minneapolis Ice Dance weekend. In the past few years it has always conflicted with our time in Maine, but this year I am happy to say that I did arrive home in time for the last session and Sunday lunch (with Sonia’s delicious minestrone soup and pumpkin bread). 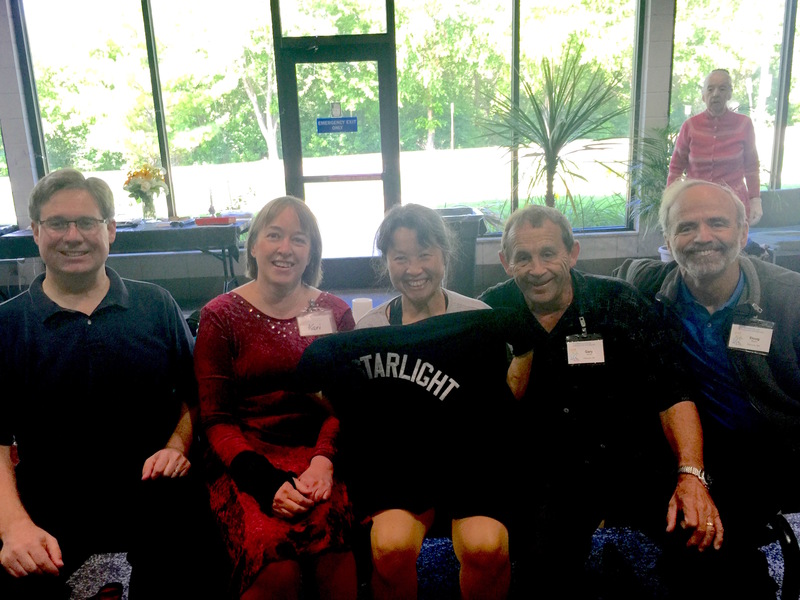 Marc, Kari, Jo trying to display her Starlight (not “tarlight”!) Ice Dance club jacket, Gary, Doug, and Barbara near the windows. So many friendly folks bending their ankles together! This made it super fun, in spite of the occasional bout of ice dance compulsory amnesia. Between the patient partners and the lucky sevens, it was a great week. Categories: basic skills | Tags: adult figure skating, adult skating, pride and prejudice | Permalink. You always have excellent advice on the knee bend, Jo. If only it were that easy to execute in real life! Glad you were able to make the ice dance weekend this year! Thanks, Eva! Wish I could have gone to Atlanta as well–the seminar sounded fabulous!